I often turn to friends to talk about the joys and challenges of relationships and try to figure out difficult situations. Do you? Recently I felt sad when a friend said they had considered marriage counseling many years ago, then decided things weren’t “that bad”. The couple tried to work things out on their own and are now divorced. Sometimes it’s embarrassing to ask for professional help or we might fear it could make a situation worse, or we think our own problems aren’t serious enough yet. Maybe that’s why people often turn to relationship counselors as a last resort in times of crisis. Sometimes a licensed counselor can help at that point with many months of intensive therapy. Often it is too late to save the relationship and all a professional can do is to help each person to face their own issues, make healthy choices and end a partnership more amicably than they could have on their own. It’s better to call too early, than too late. If you are experiencing any of the signs below, call and talk on the phone or schedule a free consultation and ask if counseling could make a difference. The worst you will hear is: You are doing great. Don’t sweat. We will NOT tell you, “There’s no hope.” There’s always hope if two people are committed to doing the work necessary to identify root problems, understand one’s one role and make changes to improve the relationship. The path to change is not easy and that’s why hiring a professional counselor to help you often makes the difference between success and failure. 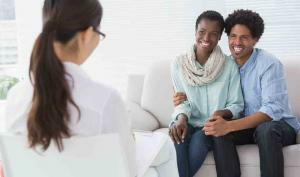 Couples counseling saves you money. Yes, it can be expensive in the short term, but it costs considerably less than divorce, even an amicable one. If you stick with the process, the positive results can last a lifetime. If you call long before a crisis, a counselor might be able to help you overcome your challenges in a handful of sessions. Here are signs that consulting with a therapist might be helpful. • You and your partner are spending less quality together and you seem to be drifting apart. • A conflict with extended family is creating tension between you. • There is one issue that keeps sparking conflict even though the rest of the relationship is decent. • You are tempted to start an affair, but know you would never actually do it. • You are in an affair. • One of both of you is angry, anxious or depressed much of the time. • A child or children are creating tension between you. • One partner stops talking for extended periods of time, or consistently stays away from home. • You are uncomfortable with a relationship that your partner has with another person. • An ex-partner interferes with your relationship. • You are uncomfortable with how much your partner is drinking or using drugs. • Multiple issues create conflict between you and never get resolved. • One or both of you insults the other or calls names during arguments. • If your partner’s words or actions cause you to feel disrespected or unsafe. • There is any kind of violence between you including pushing, shoving and slapping. Problems usually build gradually and it can be hard to know when you have reached the point where a professional could help. At Crossbridge Counseling we will talk on the phone to help you decide if therapy is right for you. Some of can also give you a 20 minute free consultation. It’s better to come too early and ensure a problem doesn’t progress, than to come too late.